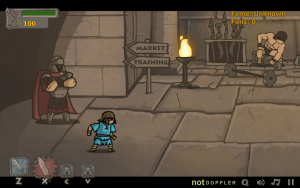 Swords and Sandals 6 is a game created by Sky9games and programmed in Adobe Flash. It was published on Notdoppler.com on October 11, and to various other websites past October 18th. In the Dacian Wars, a mighty Centurion led his squad against an ambush of one thousand soldiers. With victory assured, he was betrayed by one of his troops. He was framed as a traitor and a saboteur and sentenced to death in the ARENA.This is his legend. There are 3 types of weapons in SA. Heavy weapons, dual weapons and shield weapons. Each weapons has its own advantages and disadvantages. For example, the shield weapons has alot of Health and defense stats, but are the most weak weapons in the game. While dual weapons are the strongest in the game, but have the lowest defense and health stats.